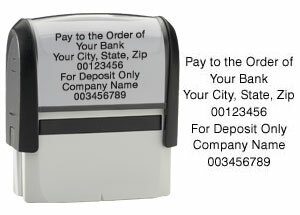 Our self-inking endorsement stamp is good for thousands of impressions. Stamp comes with an imprint sample inserted into the top of the case and a dust cover. Specify up to 9 lines of personalization, maximum of 30 characters and/or spaces per line.